J.D. Rivera’s life has been a fight. Yet through boxing, what started as violence at home, in school and in the streets, later turned into the drive to beUocome someone great. city, he was alone and had nothing to his name, his stamina and persistence has led him to achieving things he would have previously thought unimaginable. Reflecting upon his childhood nickname, “El Guerrero,” meaning “the warrior,” the brave and experienced fighter channeled his energy into making a better life for himself, and ultimately others in the process. Dedicated to celebrating those who “live their lives to the fullest and always find a way to climb on,” the beer company developed a campaign called “My Climb. My Story.” Through the first installment of this series, Coors Light sought to feature hardworking people around the country who have climbed to success, despite their odds. Fitting the campaign’s mold, Rivera’s journey to realizing his dreams and ultimately benefiting his community began in Puerto Rico, where he was born and raised until age 11. Here, he grew up on a military base as his grandfather, Capt. James Rosado of the special forces Green Berets, one of the most decorated Puerto Ricans from the Vietnam War, was stationed there. “Growing up in Puerto Rico was an experience with a clash of cultures,” Rivera said. In hopes of a better life, in 1988 Rivera and his mother relocated to Brooklyn, N.Y. After nine years in New York, at the advice of his uncle, Rivera and his mother again relocated, but this time to Merced, Calif., where they had pictured themselves liv- ing beside beautiful beaches and like the lives of the characters in the popular show “Saved by the Bell.” However, lest did they know this city was actually worse socially than New York, filled with a variety of troubles. During this year, Rivera became friends with an English vacationer, Brent Sebrer, who was living in the hostel next to his apartment. The two became good friends and would find time to skateboard together, later becoming pen pals when Sebrer moved back to London. But Rivera’s roots were calling him back to Puerto Rico, where he met his wife. He credits her as the driving force that changed his life for the better and encouraged him to stay on a straight and narrow path — lead- ing him to boxing as an outlet. resources there to build upon his own skill set, he sold all of his belongings and moved to Philly by himself at first. Later, after boxing took off, his wife, Ly Mari Latimer, and three children, Leonel, J.D. and Alicia joined him. Although there was no job lined up as promised when he got to Philly, he was soon after hired as a bouncer at Lucky Strike and started working with boxing promoter Joey Intreiri, known as “Joey Eye.” While working with Intreiri, Rivera was introduced to trainer Jimmy Washington Jr., the son of the great, late Jimmy Arthur, hall of fame Philadelphia trainer, who became his mentor and taught him the Philly shell boxing style. without top-notch boxing skills couldn’t find a gym willing to train them. Thus, through his own Warrior Boxing Academy, named after his Puerto Rico nicknamed, “el guerrero,” and after the 1979 cult classic film, “The Warriors,” he was able to give everyone that chance, while leading by ex- ample. But Rivera continued to struggle financially while back in the U.S. Looking through his bills, he remembers a time not that long ago where he thought to himself ‘God I need some help.’ In what he can only describe as a miracle, days later he received a phone call that would change his life. The agent found Rivera’s story to be so compelling he was selected by Coors Light as one of the “My Climb. My Story” cam- paign features. 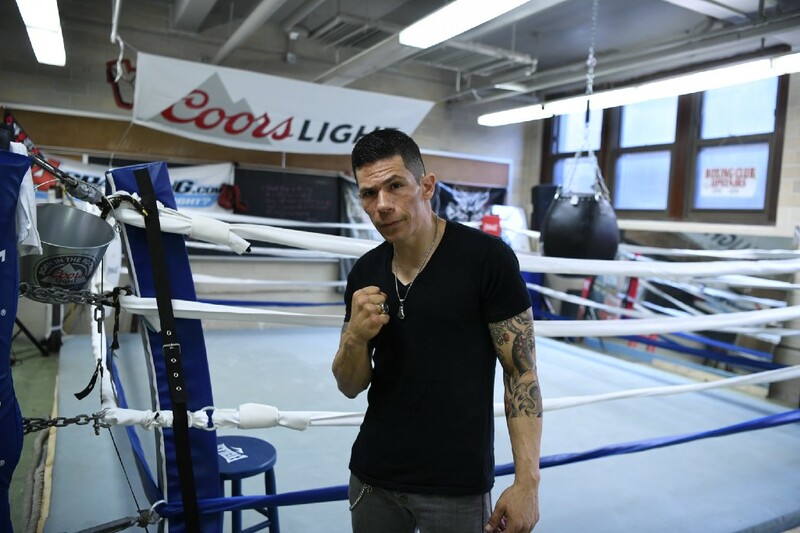 Not long after, Rivera par- ticipated in his individual short film for the series, which can be viewed on YouTube, and in response Coors Light donated to him a new ring, gloves, mouthpieces and more. “[Rivera’s] story was so inspirational to us that we wanted to go beyond just telling his story, and do what we could to help him continue to support his community,” Pando said. Rivera explained that their decision came out of the blue, like a miracle. Addition- ally, since working with the beer company, more people have joined the gym, and it has helped put more attention back on boxing. He believes that lately, eyes have been on UFC and MMA, but boxing has become somewhat forgotten. Aiming to reverse this notion though the “Climb on” platform, Rivera, whose cur- rent record is 9–2–0, and his come-from- nothing story hope to inspire others who are or have been in similar circumstances that they too can succeed. Proving that nothing will hold him back, Rivera will participate in his next fight against Dominick Monzoin taking place on Monday, June 20 in Massachusetts.